We're moving right along on our monthly mini-series Lingerie By Decade! This month is the 1940s. In case you're behind, read up on the 1920's and 1930s in my past posts. I'm not going to lie, I've been tempted to sit on a curb and fix my stockings too! In the 1940's stockings are a big deal. However, they are hard to come by and afford with war time rationing. Pantyhose or tights are not invented until the 1960's so women are still using suspender belts or clips attached to girdles to hold their stockings up. More and more women are in the work force during war time, and suits are becoming more common. 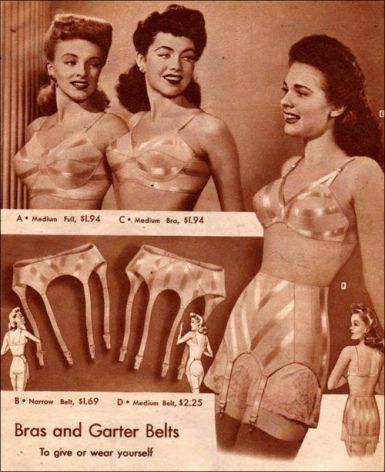 As is the trend of separates (bras and tap pants) and rubberized shape wear that started in the late 1930's. If women ran out of stockings, they painted them on. "Liquid stockings" start to line the shelves and make-up aisles. Three piece sets were very popular in the 1940's. To give women more freedom garter or suspender belts come into fashion. Worn over tap pants and with a bra. Your slip would cover all of that. Girdles are also a staple. With more and more rubberized fabrics hitting the market, these will keep your shape! Attached with stocking clips, of course! 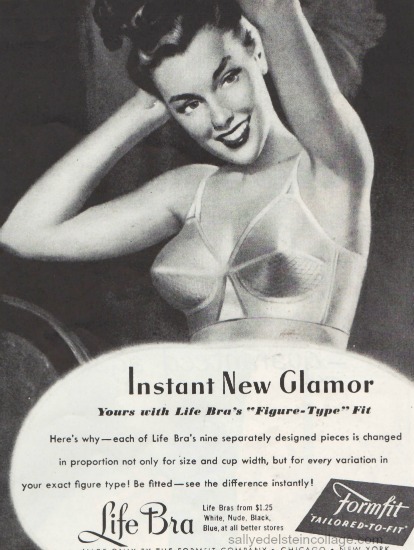 The soft rounder shape of the bra cup in the 1930's becomes much pointier in the 1940s. The bullet bra is invented with circular stitched cone shape cups. To provide lift as well as projection, the cup has many seams. This look will continue on in the 1950's and early 60's. Above is a 1940s Jantzen Whirlpool stitched bullet bra that sold recently from my shop. I'm always on the hunt for these! And finally, I leave you with some glamour. 1940's films and film noir have some of the best fashion. Long gowns and peignoirs fill the boudoir scenes. This may not have been the average lady's look, but it sure inspired all to dream and stay gorgeous during a difficult time! Veronica Lake above. Rita Hayworth below. This concludes our history of 1940's lingerie. Stay tuned for next month's installment- the 1950s! Afraid to miss out? Sign up for my monthly newsletter or follow on bloglovin'.